Thanks for your continued prayers; he needs them (as always - as do we!). I don't know if the breathing-support weaning was too fast, complicated by weaning pain/sedation meds at the same time, or if we're seeing some rebound effect from stopping the steroids, but he's taken a few steps back. It's hard for me to call in and get reports on "well, he was working too hard to breath so we had to increase this setting, but he's breathing much easier now," "well, he was struggling a bit so we had to increase that setting, but he's breathing much better now," over and over again. When we were there this afternoon and he was on increased oxygen again, I was tempted to panic that we're going to end up back on the ventilator. I admit I struggle with discouragement, then remember "Why so downcast, o my soul? Put your hope in God!" from the Psalms. My discouragement and fear are in no way honoring to Him. This is why WE need prayer too. :} I know you are lifting us up! We never could make it without the everlasting arms underneath us (Deut. 33:27). Anyway, the song "Strength Will Rise" keeps playing at really key times on the radio and tonight was played at our church's "Trunk or Treat" Fall Carnival. Such a good reminder of such a simple yet difficult truth from Isaiah 40:31. I need His strength, especially with David at home. THANK YOU GOD, for your faithfulness in sending volunteers and everything we need! Here's a couple of cute pictures of Seth to lighten the mood. :) God is good, all the time. Please keep Gracie in your prayers, too, as she needed to go back on the higher flow cannula due to increased oxygen need again. 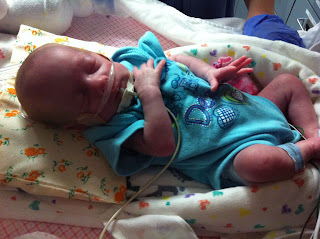 Her little lungs need to heal; thankfully she can continue to bottle feed a couple of feedings per day. Will and Marcie are still only finishing 2-3 bottles of the 8 they need to be able to take before they can go home, but otherwise they are thriving! The hospital called to say that, due to some airway closure/alveoli collapse, they had to set the machine to give Seth 10 extra breaths through his cannula. 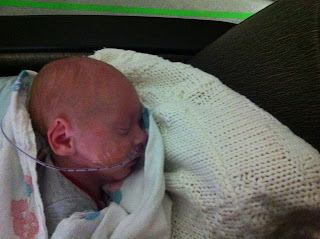 It's kind of like being halfway between CPAP and ventilator; we PRAY he doesn't need any more help than he's now receiving! Perhaps he was weaned a bit too quickly off of the machine settings, the nurse practitioner said; we certainly hope and pray this isn't any sort of rebound effect from the steroids. Please continue to pray for Seth's peace and healing. Again, to God be all the glory! The other 4 babies continue to do very well, praise God. 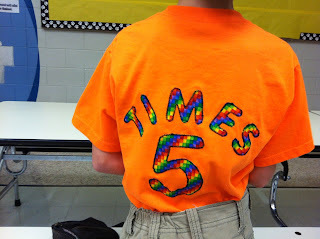 all 3 boys are longer than Isaac was (18+ inches). So much for my fear of "puny-ness!" Will's HUGE! 8 lb 4 oz, and not even "due" for another 9 days! 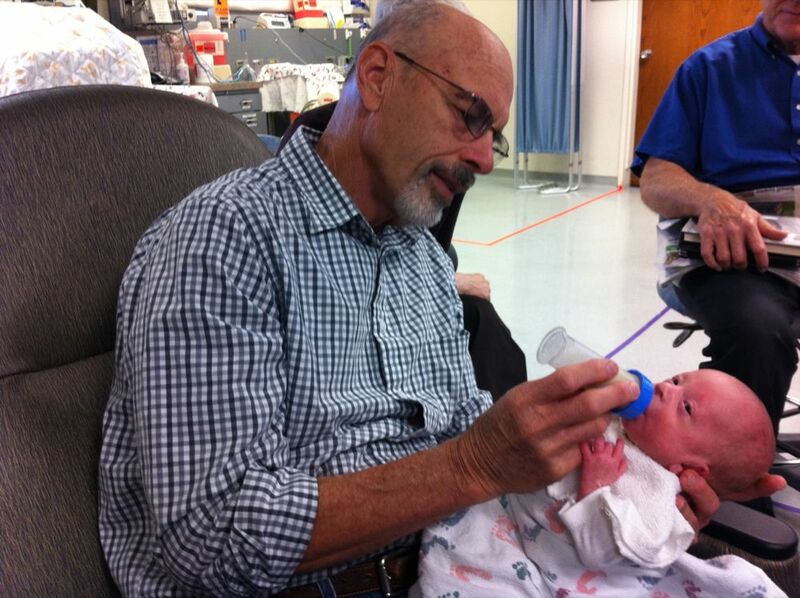 Praise God he's still doing great; please keep praying during this weaning time! 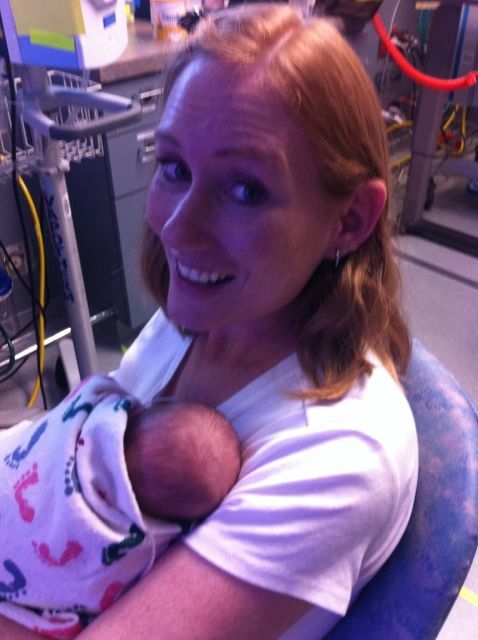 Carrie got to hold Seth today for the first time for an hour and a half! It was a wonderful experience for her. He cried a bit at first (which was wonderful to hear), a hoarse, but precious cry, then settled down and got comfortable-- too comfortable. He decided that he was too happy to breathe, so we needed to wake him up a bit. He is at 30% oxygen and very stable. In comparison, Grace is on 29% right now! The biggest prayer, of course, is that he doesn't rebound (negatively) when the steroids are weaned. We would love it if his body can continue to act this way when the steroids are gone. David had his first pediatric appointment today and the doctor declared him "perfect" and that he's not really recognizable as a preemie! 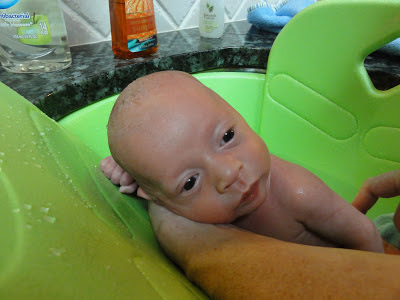 David after his first bath at home. Grace is down on her flow to 2.5 liters per minute and doing well. Marcie and Will are doing well, too, but not getting their full feedings from their bottles yet. 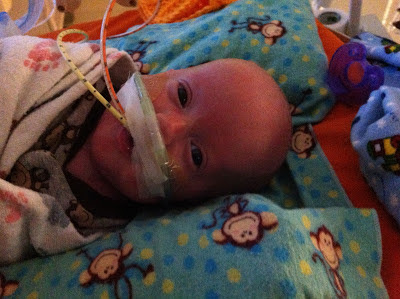 Will is getting a tiny bit of oxygen, but doing fine. He seems to be the lazy one of the bunch, not wanting to eat or eating slowly. He's definitely the most vocal. He let's you know if he doesn't like something. PRAISE GOD, Seth is on some sort of breathing-rated, large nasal cannula, no tube down his throat, able to cry or grunt or coo like his siblings!! He was extubated at 6:10 this morning. This is so amazing it's surreal. Please, please keep praying (I know you will) that his scarred lungs will tolerate the changeover and even thrive! Seth, the last time I called in, was on minimal settings on the regular ventilator. The next step is CPAP (the nasal prong/mask)! If his 4 a.m. blood gas results and x-ray look good, they will most likely take the breathing tube out, move him to CPAP, and we'll be able to hear his voice for the first time! Granted, it will likely be either grunting or crying, but what a blessed sound that will be! Please keep praying God's protection over and healing for his body and lungs. Also, that he will be comfortable - he started getting the "shakes," sweating, flaring his nostrils, and bad diarrhea as a result of a lowered morphine dose. He's on an increased dose now but seems to be a bit agitated still. Please pray for his peace and comfort and wisdom for the staff to wean him in such a way that his body can tolerate it well. As always, please also pray for protection for his brain through all of this! Update as soon as we hear something tomorrow . . .
Seth is OFF the oscillator, on conventional ventilator with moderate settings only, at only 35% oxygen, and is still being weaned down on his oxygen!!! He has had a very favorable response to the steroids, medically-speaking, and I know thousands of prayers have gone up to the Lord on his behalf. To God be the glory! We pray this healing continues and that his little lungs don't experience any kind of rebound when the steroids are weaned. The neonatologist said that some kids with really severe varieties of BPD (bronchopulmonary dysplasia) don't respond to the steroids at all, and that he was concerned Seth would be one of those. Now, he's even hopeful that Seth could come home without a tracheostomy. Yes, Lord, please! Thank You Your work in his body! And please protect Seth's little brain in the meantime. Thank you all for your prayers in that regard, too,. Please also pray Marcie, Will and Gracie will all be able to come home without oxygen or any breathing support. What an amazing work of our Almighty God that would be; to have had quints born so early be so healthy upon discharge! 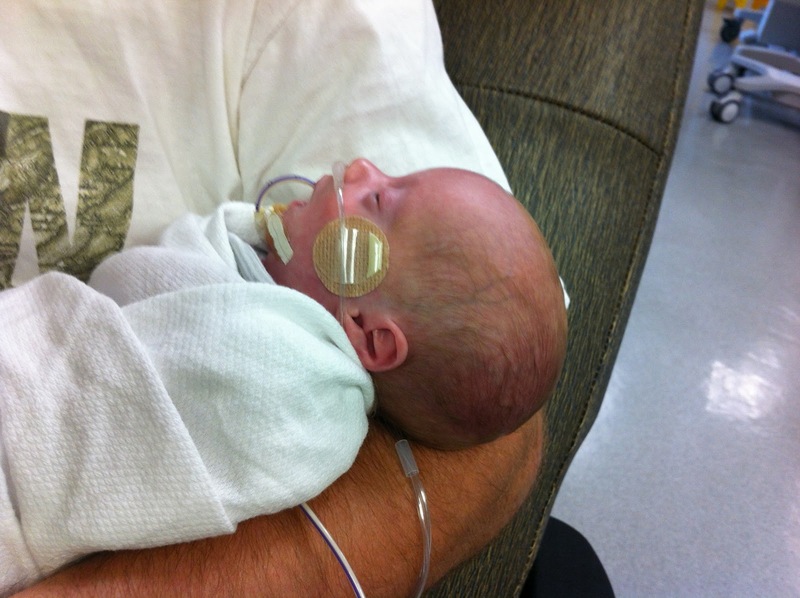 Marcie still needs some oxygen when she's eating; Will is still on it all the time, at the lowest possible flow rate, and Gracie-kins is on quite a bit of cannula support yet. Thank you for caring and praying, as well as for the gifts, acts of service, cards, and diapers (and yes, there are always more needed, ha, ha!)! Yes, David has arrived home! We spent the night at the hospital last night with him at our bedside-- not going to happen much longer since he (and his siblings) is such a grunter. 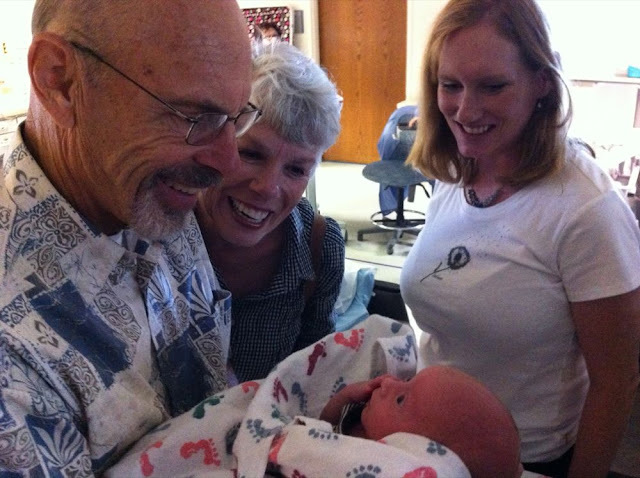 All went well and we brought him home at about 2:30 to a welcoming big brother and two happy sets of Grandparents. He is doing great and we are embarking on yet another phase in this journey. Seth is doing about the same today. They were to start him on the steroids today for 10-12 days and are hoping that his lungs will respond this time. The intention of the medication is to "re-recruit the lungs." Please pray with us that it will be successful and allow him to be weaned off the oscillator. Marcie and Will are doing well, though still needing occasional oxygen supplements. They won't be too much longer in the hospital. 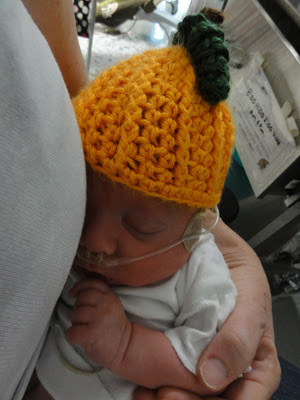 Grace is still needing a good bit of flow on the vapotherm and significant oxygen, so she's likely to be in the NICU for some weeks yet. Marmi and Papa get to hold David for the first time. Debonair David knows how to pose. Papa's first try at feeding. 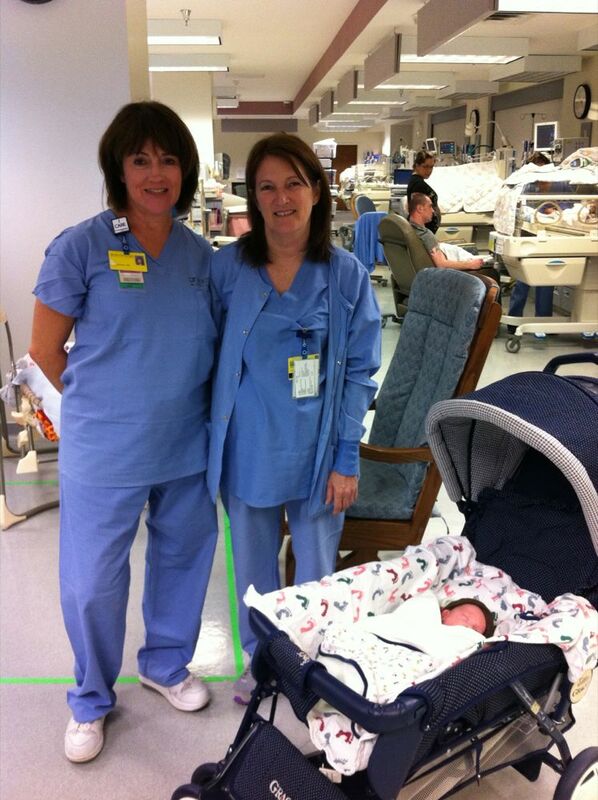 Julie and Mary, two of the many amazing nurses who are caring for our babies. A fuzzy picture, but the first one with all four babies in it. Left to right: Marcie, Grace, David, Will. 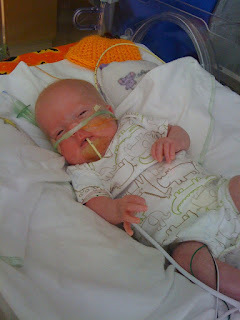 Due to some worsening of Seth's lung x-ray and blood gases necessitating higher machine settings (beyond the "poop crisis") the Neonatolagist has ordered more steroids to try to reduce the inflammation of Seth's lungs and allow for weaning of both machine and oxygen. Please pray!! Also, we ask God's protection over his brain as the steroids can cause cerebral palsy and inhibit brain development. At this point the benefits outweigh the risks, they feel. For us and Seth! He had an enormous, 5-diaper bowel movement, truly record-setting, and since then he's been able to get down into the 60s on his oxygen. Thank God!!!! He works in mysterious ways, His wonders to perform. 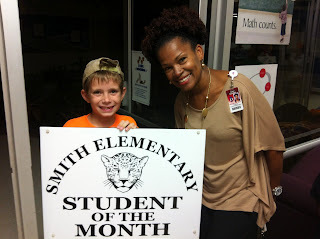 :} Seriously, thank you Lord for your power and love at work in our lives, especially Seth's. Thank you all for praying!!! We're here at the hospital "rooming in" with David. 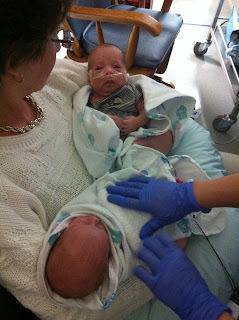 Please pray for us as we start our new lives with a preemie at home, 3 more at St Paul's, Seth at Children's, and Isaac. I am already reminded with David that babies don't have on/off switches, even when I want to rest my weary eyes. To God be the glory; we desperately need Him! He's not doing well at all right now, was "bagged" three times so far today to try to get his oxygen saturations up out of the 50 and 60% range. He's also requiring higher machine settings (twice raised) and at least 90% oxygen (vs. 59% last night) to keep his oxygen saturation where it should be. They don't know what is going on and are trying to figure something out. Please pray for wisdom, for peace, for Seth. We are heading up there right now with my parents. Thanks so much for your sweet comments about the slideshow! :) Thanks most of all for loving and caring about and praying for our kiddos and for us. 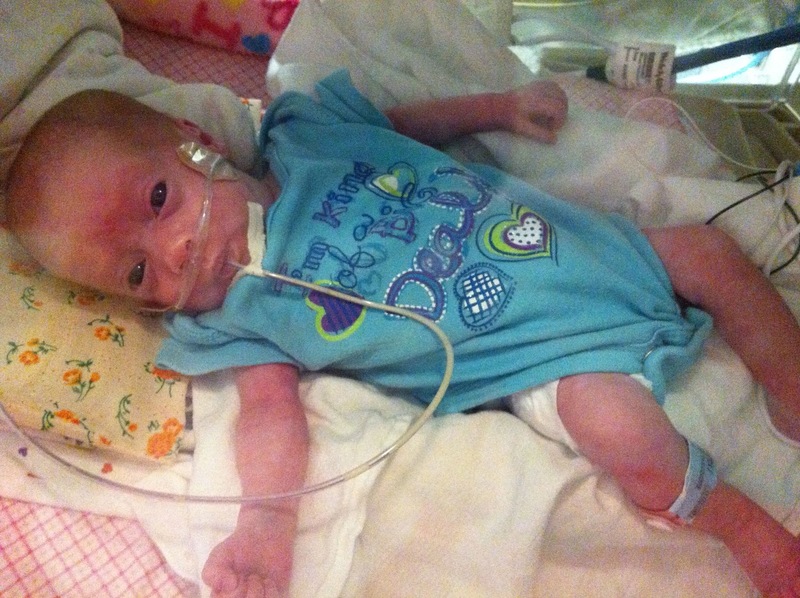 Quickly: Grace may need a tracheostomy if she doesn't make good progress these next few weeks. She has been unable to come down on her airflow (delivered by "Vapotherm" nasal cannula) and is still receiving oxygen. She will definitely come home on oxygen by cannula, it looks like, but if she needs a good steady flow of pressure to help her get the oxygen and remember to breath, she'll need to be on a home ventilator that will hook into a hole ("stoma") in her throat. Please pray she heals quickly so she doesn't need that! Her lungs aren't in great shape; easy to forget in the concern over Seth. A tracheostomy would also mean slight stomach surgery and a g-tube to feed her directly into her tummy. That is a whole new level of complexity and at least a week of full-time training for her parents. Overwhelming to think about, so we'll ask you to pray and take it one day at a time. The Lord knows and will enable! We pray He heals Grace to the point no surgery is necessary. Will and Marcie both have the exact same genetic mutation as Seth, yet Gracie (who is the sickest of the other four) does not! Neither does David, which we expected, given that he is the healthiest and the only one not to have ever been on a ventilator. So the mutation appears to be much less of an issue in Seth's healing (or lack thereof at times) than we first thought. The specialists said this test of the others would be very telling, and indeed it has told us that babies can have the mutation and be apparently unaffected. (Marcie and Will are doing very well, on no or minimal oxygen and flow.) Again, the mutation is on one chromosome only and the paired chromosome is normal, so either this "mutation" is a normal variant or the corresponding gene on the other chromosome is normal and making up for the mutated one. This gives us great encouragement for Seth, as does the fact that he is creeping downward on his machine settings and his oxygen a tiny bit. PLEASE PRAY that continues, if the Lord is willing! He was so alert and sweet and tolerant of my cuddles and talking (and his Grandpadad's) tonight. I praise God for that time and for His work in Seth's precious, beautiful little boy body. 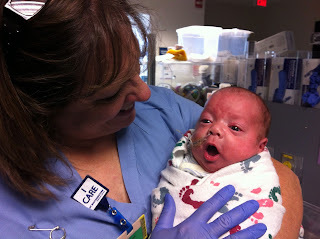 We are rooming in tomorrow night with David, learning all we need to about preemie care so we can take him home Saturday! WOW!!! All the St. Paul babies gained weight today (no news on Seth's weight yet): Will is 7 lb 5 oz; Grace is 4 lb 7.4 oz, David and Marcie are both 5 lb 9.6 oz! Quick update on Seth: He seems to be sailing through the critical period of the nitric oxide discontinuation, praise God. He hasn't had any rebound or other negative effects. Thank you for praying! He no longer has pulmonary hypertension but he still has very damaged lungs. 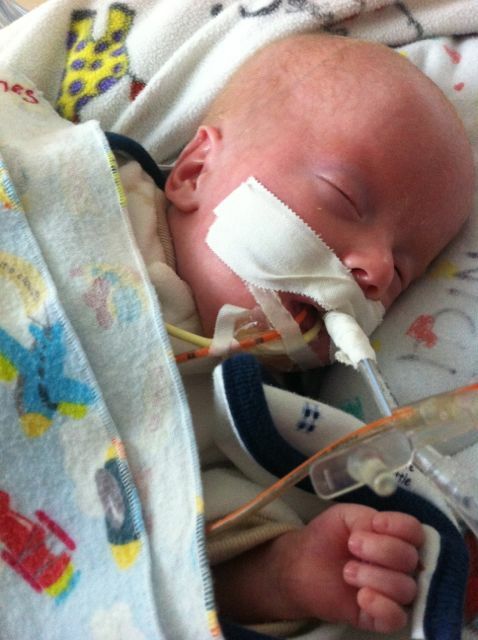 They have been able to wean his machine settings a tiny bit but not the amount of oxygen he's receiving. The progress is slower than they had anticipated or hoped, and the doctor said yesterday, "He's still very sick." They are considering using steroids again but are debating the pros and cons. 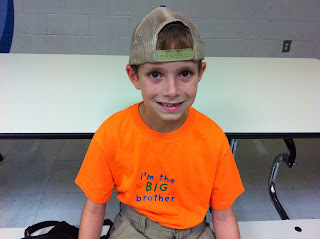 So thank you for continuing to pray both for Seth and for wisdom for the medical staff. Will is 7 pounds even now! 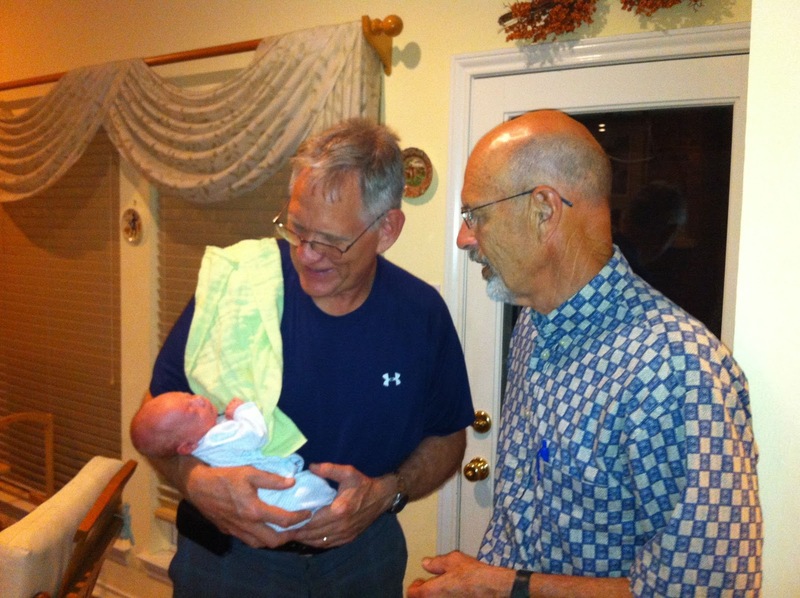 Seth is 5 lb 12.8 oz, David is 5 lb 5.5 oz, as is Marcie, and Gracie is 4 lb 5 oz. Marcie is on only very minimal airflow, as is Will, and Gracie is needing more airflow. Please pray her lungs continue to heal and she continues to grow. We found out today that Marcie has the same genetic mutation as Seth and that David does not have the mutation; still awaiting results on Will and Gracie. I am encouraged that maybe this means Seth has just plain old bad lungs that he can outgrow, unless he's more affected for some reason by the genetic mutation. Perhaps it's a "variant" rather than a "mutation," according to one specialist; he says 2% of people of European descent have it on one gene like Marcie and Seth! Hi! Sorry so silent for the last few days. It's a bit tricky to have kids in two hospitals and Isaac at school and home, plus, praise God, there have been no emergencies. However, I want to ask for prayer for Seth the next few hours and days as his nitric oxide has been discontinued and his little lungs need to adjust. He was very touchy and de-satted quite easily with touch, noise and light yesterday when they weaned his nitric a bit more; today's discontinuation could be more upsetting to his system. 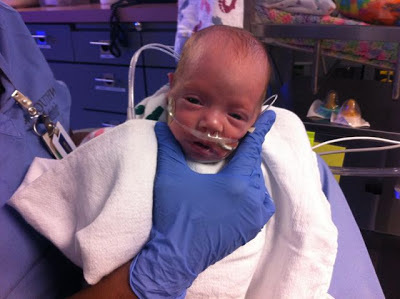 Then, we pray he will be able to receive less oxygen support and that his lungs will heal enough so as to need less pressure to keep the tissues from sticking together. Thank you for joining with us!!! Baby shower tonight - what fun! I am working on a video/photo presentation for it which we will post a link to later. And David is getting more vigorous and strong - he needed a blood transfusion which perked him right up. So he may be home in days! Will most likely won't be far behind. He was almost 7 pounds last night, but he still needs oxygen occasionally. 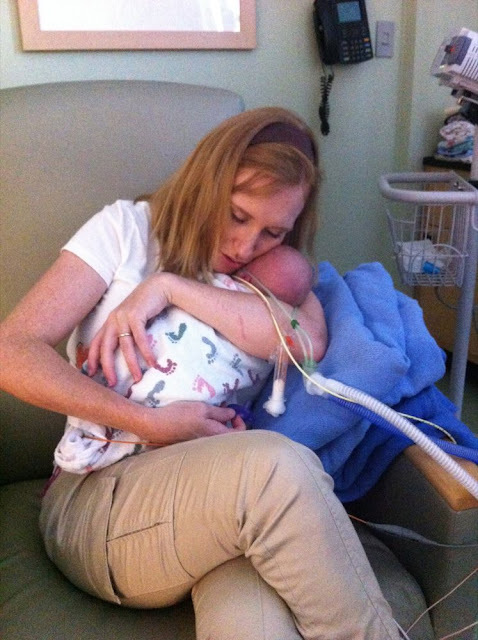 Grace needs the most help with the oxygen cannula flow and amount; Marcie is learning to take just one bottle a day without tiring out too much. Thanks again for ALL you do to bless us! An most especially for your prayers. 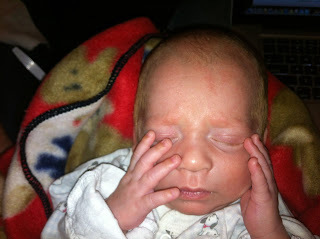 Darling David was too tired out to take all 8 bottles today without dropping his heart rate (bradying). He needs to gain weight and strength and then they will try again. 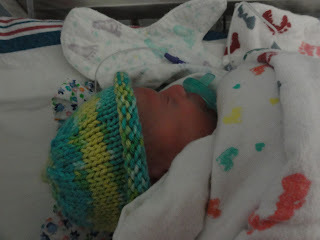 For now he's getting 2 of his 8 feeds by tube. Will is 6 lb 12.6 oz! Enjoying my little Marcie girl! 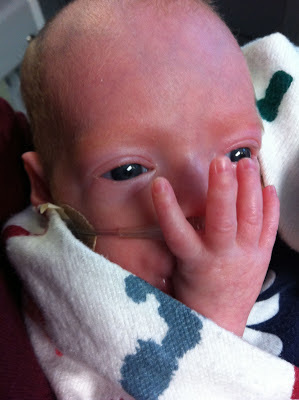 Sweet Seth is still de-satting, on 72% oxygen but only 3 ppm of nitric. The echocardiogram found no evidence of any pulmonary hypertension, praise God. Please pray these de-sats STOP, Lord willing!!! And that he will be peaceful and less touchy, poor baby. Hi faithful friends, family, prayer warriors and caring "strangers,"
He's also more agitated today; the nurses have orders to give him more meds as needed to help with that. Thank you so much for praying. Today I found out that 4 of our 5 kiddos actually have BPD. I thought only Seth did. 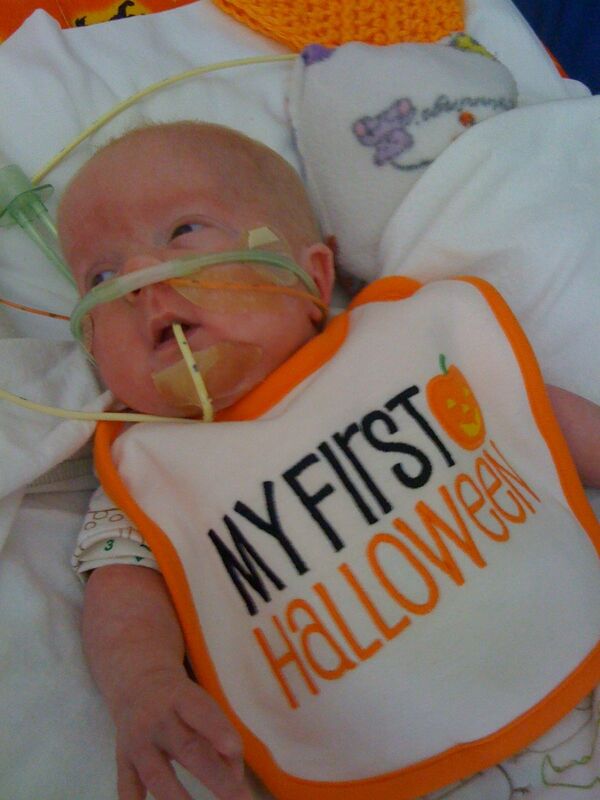 But Will, Marcie and Grace also have some scarring in their lungs and still need oxygen. 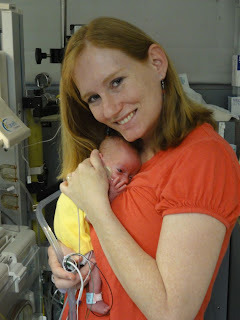 Will and Marcie usually only need a tiny bit; Grace tends to need more, not surprising given how tiny she was/is and that she was the last baby out of the womb and needed ventilator support in her early weeks. Which brings me to the flu shot. . . why are we requiring volunteers to get it? (After all, beggars can't be choosers, right?) :) I guess you already know the short answer: Because the influenza virus, which affects the respiratory system, could very easily kill our babies. We just can't risk it especially as people are contagious 1-4 days BEFORE having any symptoms. Even scarier: some people are carriers and never have symptoms yet can give it to others, so your strong immune system may not be protective for our kids. It is contagious from up to 6 feet away, spread by coughing, sneezing and even talking, plus of course direct contact and sometimes surfaces. Which brings me to the main point of this post: In the very near future we will need many volunteers to help with baby/family care. (Please, please, please!) 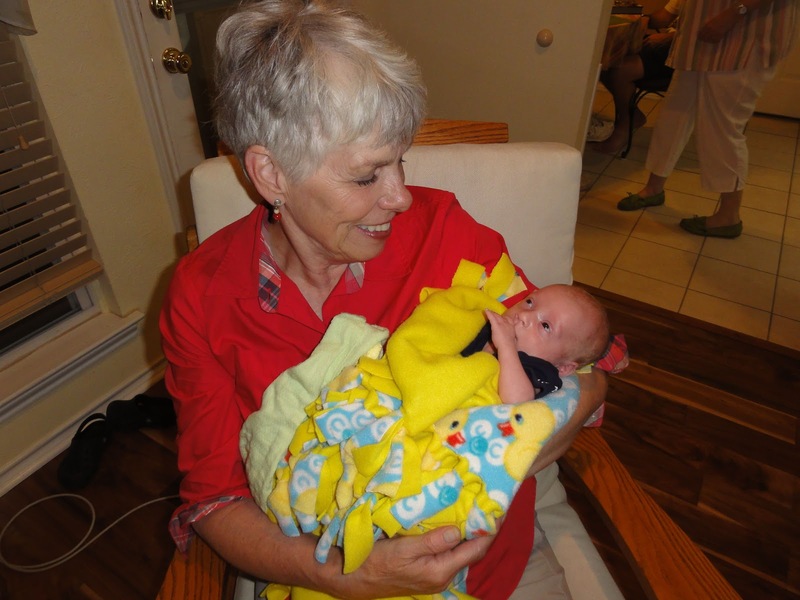 If you have previously expressed interest in helping, you should have received an email from Stacey Walter outlining a basic description of the volunteer shifts as well as outlined the health requirements to work with the babies. If you have not received that email, please send Stacey an email at jonesquints@yahoo.com. Once you have responded to her regarding the health requirements, you will be able to see the available shifts to sign up for baby/family care. Oooops Again. And a baby's coming home?! A correction for Carrie's first "Oops" post. No, Will has not gained 2 pounds in a day. He is definitely big compared to the others, but he's not packing it on quite that fast. (I suppose it's possible he's sneaking off in the middle of the night to get a 32 oz steak at Texas Roadhouse, but unlikely.) Early morning postings tend to lead to exaggerations (or maybe we should just call it a typo). 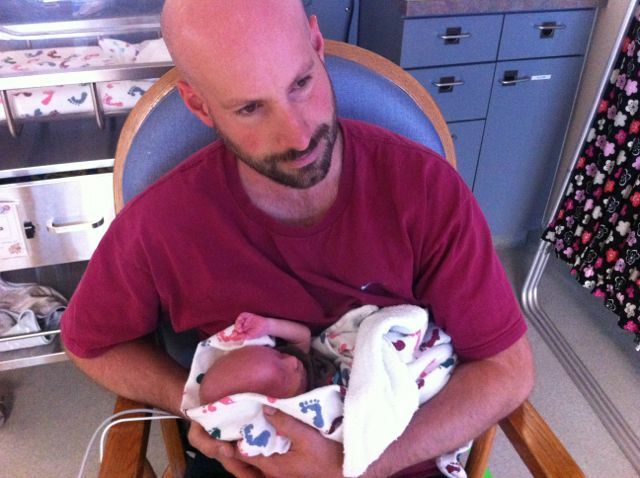 Will is 6 lb, 10 oz. Today's big news is that David is on schedule to come home on Saturday! He has to go 5 days straight without having any "sleep alarms." That means he has to breathe on his own without any drops in heart rate that set of the monitor alarm for five days in a row. Friday will mark the fifth day, so we'd bring him home on Saturday. If he has a sleep alarm, then the clock resets, but he is on track for that now. 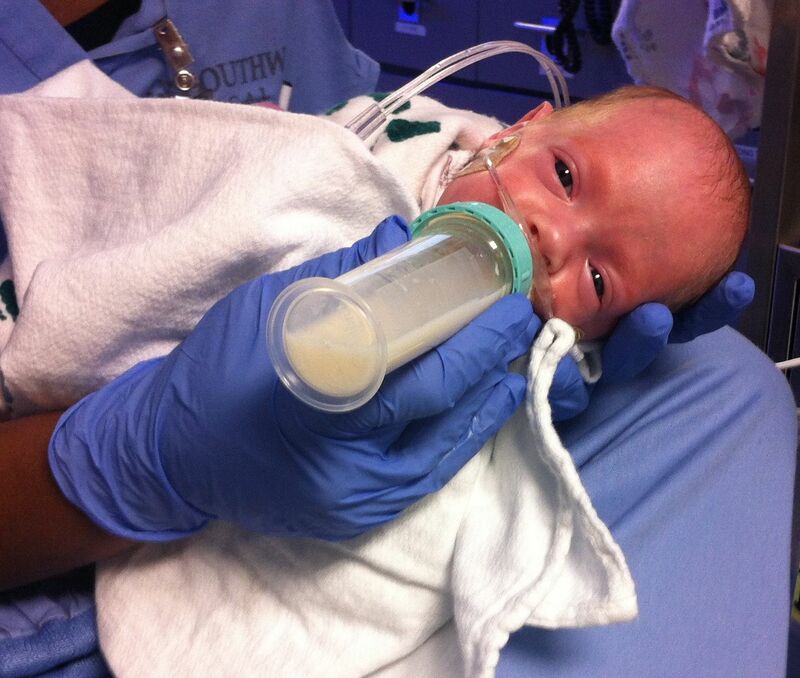 He's taking all of his feedings from a bottle and doing great. Life is about to REALLY change for us! Up until now, we really haven't felt like a family of 8. We aren't in constant care of six kids, but just one. 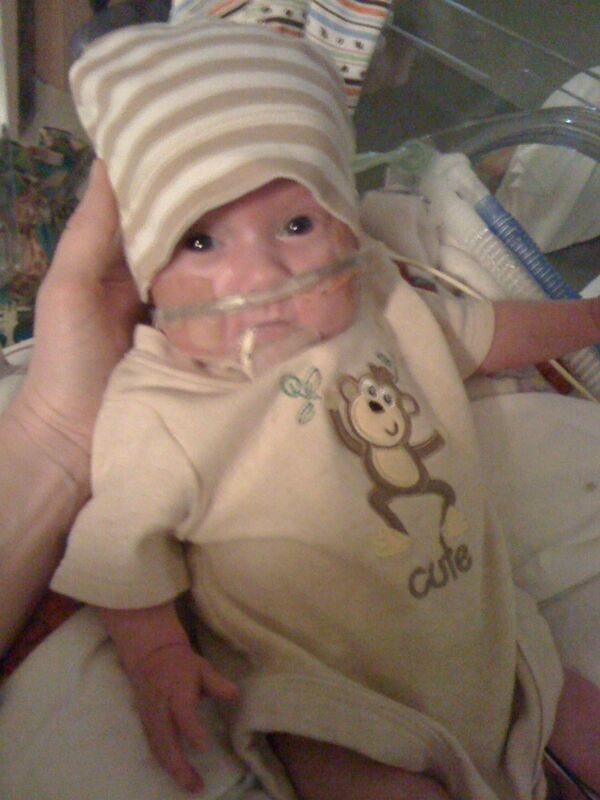 I may offend someone or sound crass by saying this, but I have felt since they were born that going to the NICU is kind of like going to a petting zoo. The babies are really cute. We looked at them from the other side of the glass. Later, we got to hold them and "pet" them and feed them. We have had to use hand sanitizer all the time. The "keepers" (nurses) show us how to feed them and hold them and take care of them while we're there. At the end of the day, though, we say goodbye and head back to our "real" lives, not having any direct physical responsibility for caring for them aside for when we are there. Well, the petting zoo is heading our way! We are thankful that they are not all coming home in one swell foop. Inching our way from one baby to five in a gradual manner will have its own challenges, but I think will be more helpful to our sanity than going from none to five all at once. We are just so grateful that there are so many people on board to help us out in so many ways! Bless you all! Seth is holding his own. He's about the same as before. 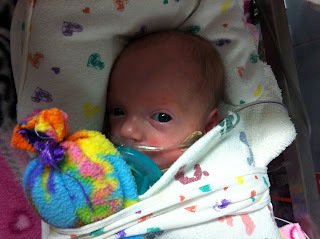 Comfortable and happy and healthy looking, but needing significant pressure to keep the lungs inflated. They are continuing to wean the nitric and hope to have a good idea of whether the hypertension has been addressed fully in a few days. He's still a very sick boy and needs serious and intense care and prayer. Marcie had her first feed from a bottle today and took to it quicker than either David or Will. She actually finished the whole feed from the bottle, which neither boy did. Grace is pretty close to starting a bottle, but has a few levels to go down on her oxygen support and air flow from the vapotherm machine. Will is doing great, but still not caught up to David as far as his bottle feedings. He won't be much longer in the NICU, though. The nurse said Seth is okay, but he apparently still needs more pressure from the machine than it seemed he did last night, so they had to go back up. Thanks for continuing to pray for his healing, if the Lord is willing! Off to feed and visit babies . . . Waiting on a call back from Seth's nurse to check on how he did through the night. . . update in minutes(?). We've been riding high the past few days, hoping and praying we don't make a sudden rapid descent again health-wise with the babies, especially Seth of course. He has been doing remarkably well. He is way down on his nitric and on his ventilator settings compared to where he was when they transported him to Children's. There is still some concern he may have pulmonary hypertension that just isn't evident on the echocardiograms, so they're keeping a close eye on how he does as they wean the nitric. If he appears to still need a vasodilator, they will switch to a different drug that is safer for long-term use. We pray he won't even need that, of course! He's at the lowest vent settings he's been since he was put on the conventional ventilator a month or so ago, and he's actually doing better with his oxygen saturation tonight than he was at the higher machine pressure setting earlier today. We pray that continues! There's been no mention of switching vents as the oscillator does such a good job for his kind of scarred lungs, plus he's tolerating it so well. His nurse tonight said he's just super content, even when being weighed (5 lb 7.5 oz!) and bathed and dressed. His oxygen levels aren't dropping like they used to upon stimulation. Yay, buddy! Hallelujah, God! And thank you all for praying! Please continue! He was at 100% oxygen saturation (55% oxygen being delivered by machine) when I was there today singing and cupping his little head and legs in my hands. He likes that. :) He sure can stare into my eyes! Grace has very slight vascular abnormality in her right retina ("very light stage 1, no plus, outer zone 2"); please pray that resolves/doesn't get any worse and that her retina develops fully normally. 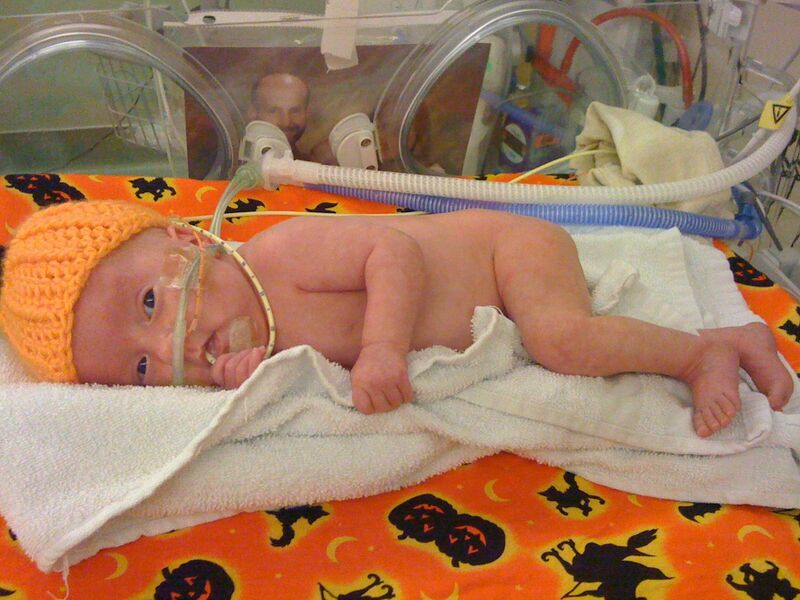 We pray that for all the babies, especially Seth since he's been on the most oxygen which can damage the retina. 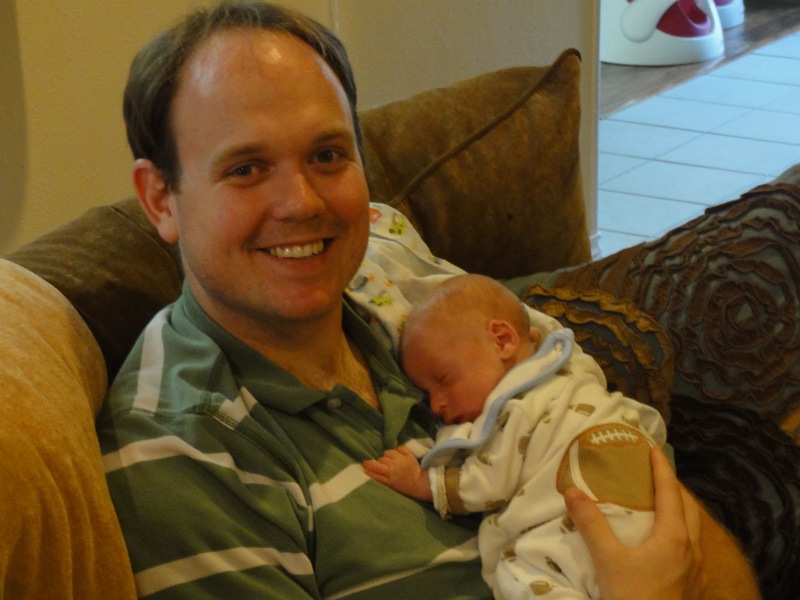 A huge praise is that Will and David's final head ultrasounds look completely normal! No "white matter" brain disease at all from their prematurity. We pray their siblings are doing just as well even though they aren't due yet for that exam as they aren't as close to coming home. Will is up to 6 lb 10 oz - wow! I don't know David's weight today and I'm too tired to call . 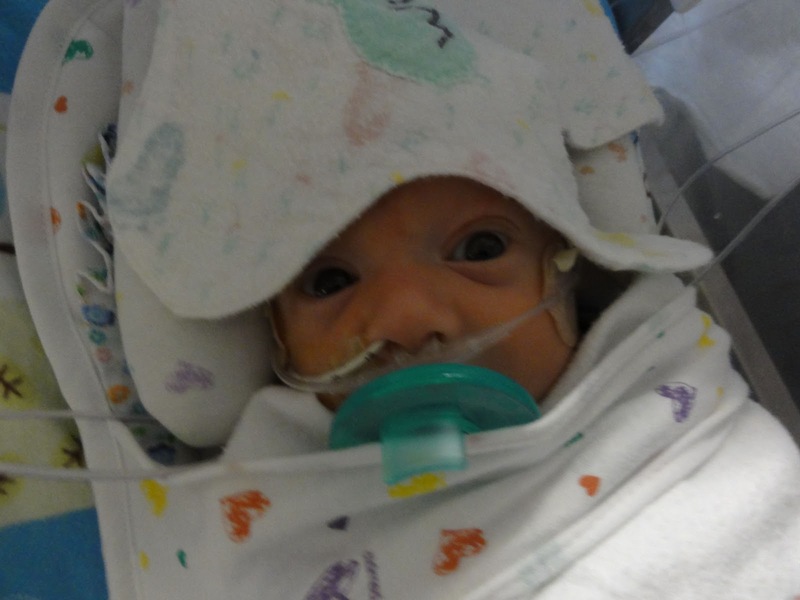 . .
Gracie is in an open basinet like her siblings now! Hurray, Gracie! She is 4 lb 1 oz and maintaining her temperature well. Her eyes are so huge in her tiny face when she peers up at me! Darling dolly. Marcie is almost ready for bottle feeding to start, most likely tomorrow! She's on only 1.5 liters of air and a tiny bit of oxygen, just like Will. She's 5 lb 1 oz, the big girl. More later - I have to rush to Children's to be with Seth during his "touch time." His nurse says she couldn't ask him to be any more content! THANK YOU Lord! And thank you all for asking for his continued peace, healing, growth and, ultimately, God's will. In response to my recent post on needing volunteers, I have received several questions similar in nature and thought it would be helpful to share with everyone. 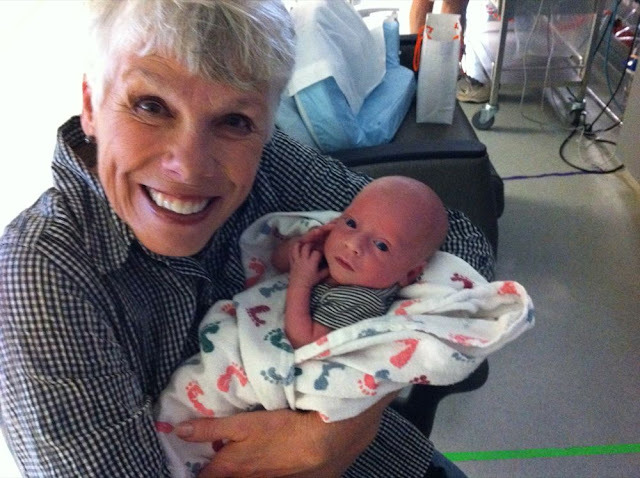 Q: I am unable to care for the babies or don’t live near Dallas, so what else can I do to help? A: There will be plenty of opportunities to provide meals for the family and the volunteers. Additionally gift cards would be appreciated (amazon.com, crocs.com and Visa gift cards) to help with purchases of diapers and other baby needs. 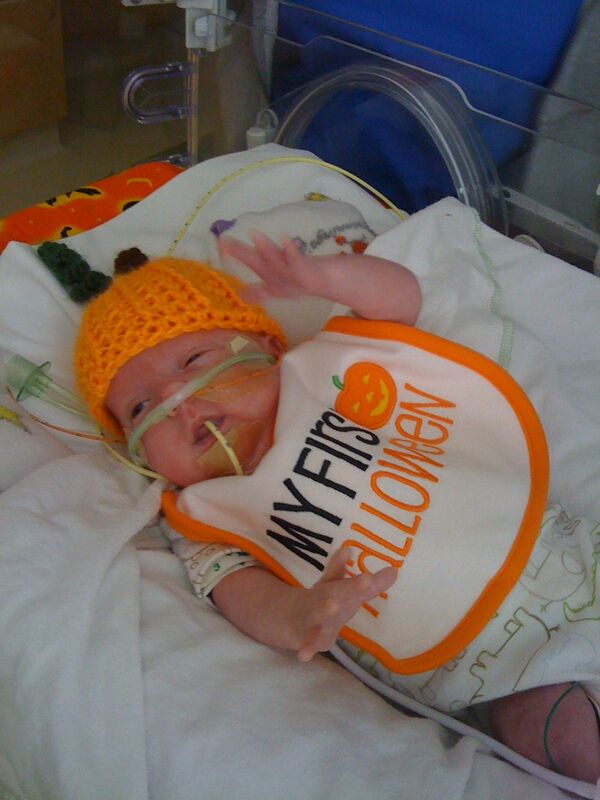 Other gift cards that would be used are gas cards and restaurants as they make daily trips to the NICU. If you would prefer to buy a gift and mail it to them, the address is: Gavin & Carrie Jones, PO Box 382479, Duncanville, TX 75138-2479. Please include a gift receipt in case they receive an abundance of one size of diapers, they could then exchange them for a different size. Q: Can a volunteer shift be split with someone (either the 5 hour day slot or the 8 hour overnight shift is too long)? A: Short answer is most likely yes – it will honestly depend on how many volunteers we have sign up. If we are short on volunteers, then we will definitely need to split up the shifts. So if you have interest in helping but the time slots are an issue, please email me and I will see if I can work something out. We have been overwhelmed by all the meals, gifts, prayers, notes, words of encouragement, hugs, and acts of service heaped on us by so very many of you! For those in the area, our church is hosting a baby shower, but please don't feel like you need to bring anything! We want to say thank you to YOU and show you our babies from afar, including some video hopefully. The text of the invitation is below. 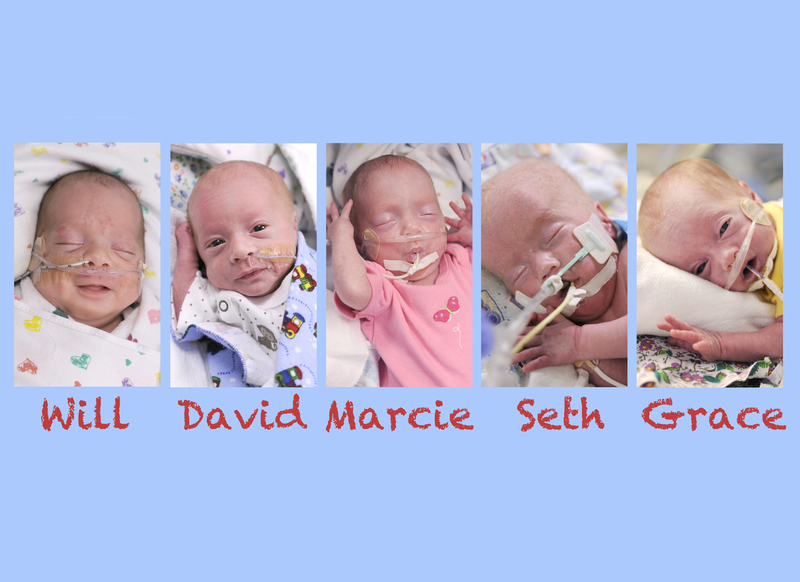 and photos of the quintuplets. 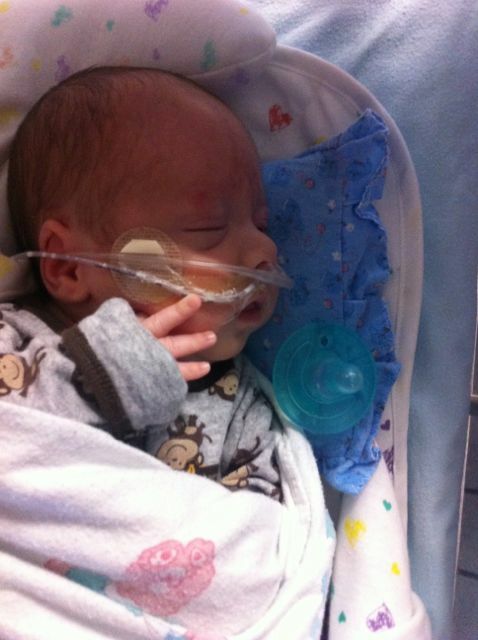 He loves his new open set-up and swaddling rather than being in the closed incubator! 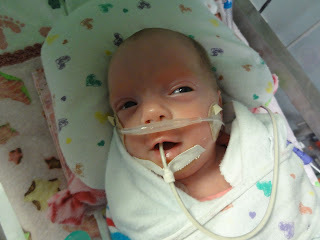 Gracie is up to 3 lb 15 oz, so thanks for praying for her continued weight gain! Thanks so much for praying for weight gain for Grace! Even after a 72 g "blowout" (poor nurse), she was 3 lb 14 oz tonight! That's 2.5 oz of gain. 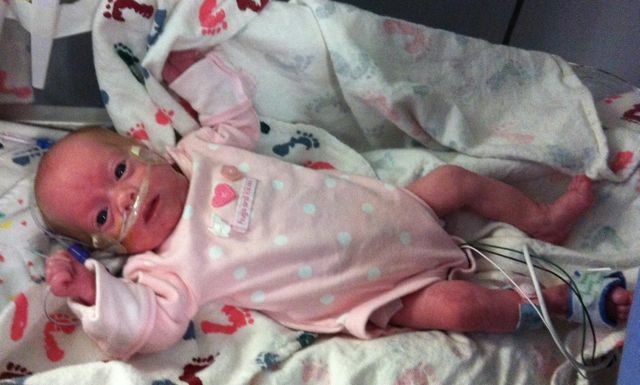 Gracie's onesie says "I'm kind of a big deal"
Thanks also for praying for good oxygen saturations and heart rates. Only one episode today, and it was Gracie, the smallest/youngest. Marcie was able to go down on the pressure being delivered by cannula, and all three kids on oxygen at St. Paul are needing less than yesterday. Please pray that continues! Will was eager to socialize until we swaddled him. Will and David both nursed awesome today, and Seth is doing really well at Children's. He was so alert when we went to visit him! I love how he looks right into our eyes when we talk to him. I also love that they've been able to wean his machine settings and nitric oxide without him needing too much more oxygen (60% still, though, so PLEASE KEEP PRAYING) and without his carbon dioxide going high. The nurse did say it's still pretty serious that he's on the oscillator support at this age, not even able to tolerate a regular ventilator, so he's obviously greatly in need of the Lord's healing touch. 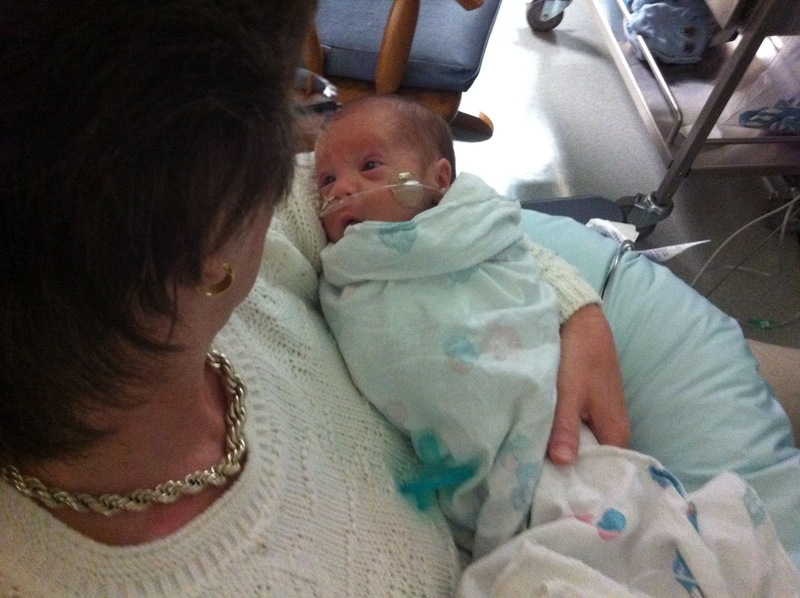 He grew more last night, though, so is well over 5 lbs, praise God! We are deeply grateful and encouraged by blessings in the midst of the uncertainty. We love him so much; we passionately hope God's will includes his complete earthly healing very soon. Thank you for all the prayers and kind words from everyone, even as far away as Ireland, Norway and Australia (not to mention PNG, of course)! 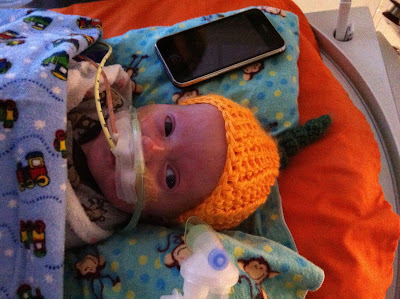 Seth was comfy and doing well (for Seth) when I called tonight, on 54% oxygen. He doesn't have another assessment until the morning, so he can get a good rest tonight. Thanks for praying! 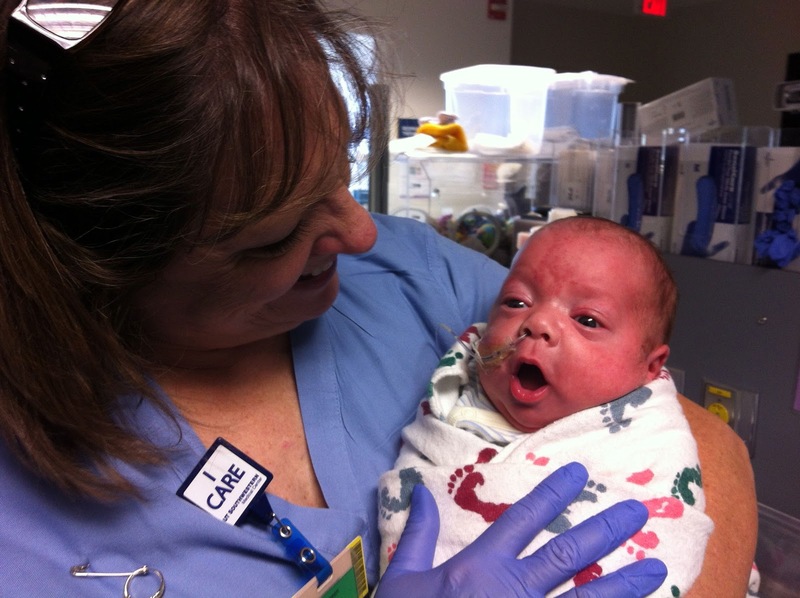 As you might imagine, in the coming weeks there will be a huge need for volunteers to help with the baby(ies) at home while the other babies are still in the NICU. Another important need will be for help overnight as it is critical that they get as much sleep/rest as possible. Many of you have already let me know that you would like to help. I sent an e-mail on Tuesday, October 2 with detailed information regarding the volunteers. If you could please respond and let me know which shift you are able to sign up for so that I can begin a schedule of volunteers. If you are unable to commit to a specific time slot, that is fine - there will be shifts you can sign up for on Lotsa Helping Hands (once you confirm the other information to me that I sent in the email). If you did not receive that email, please let me know and I will send it to you. 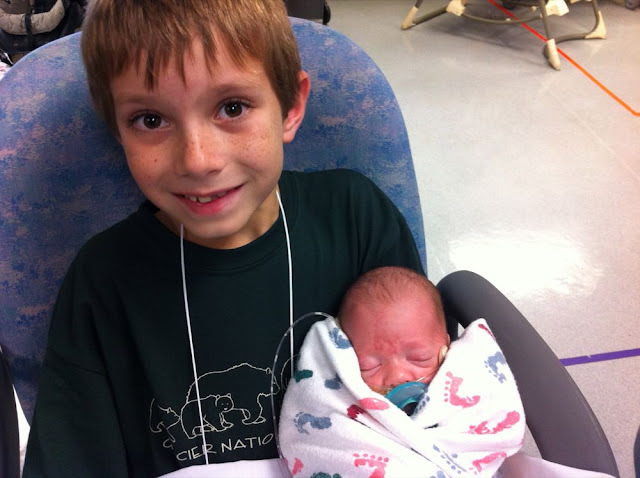 Seth handled his transfer to Children's very well, praise God, and appears to like it there. 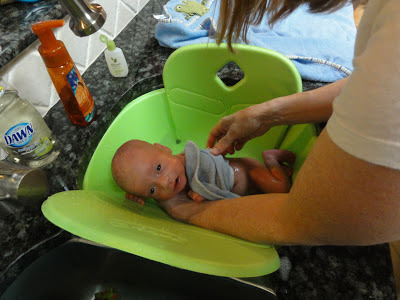 :) He is in his own room with the top off his isolette, so it's more of a bassinet set-up. We took in pictures, blankets, hats, preemie shirts, etc. so he could have a more personalized space, see our smiling faces when we can't be there, and look extra cute. (Thanks Sarah, Shauna, Doris, Sandy, Aunt Joanne, Manns, Joan, Limbo Links ladies, Arlene, Carly, and others I know I am forgetting! He's so big he's already outgrown the hats from some of you!) We also have the recording of my singing, talking and praying to leave there for his listening pleasure. He could only tolerate about 10 minutes of time with us today, but he really LOVED the time initially as evidenced by his oxygen saturation going up to 100% without the nurse touching any settings on his oscillator. After the 10 minutes he started de-saturating and went to sleep, so he was politely ushering us out. :) He looks great, so that was encouraging to us. The comprehensive echocardiogram reveals a real answer to prayer: his pulmonary hypertension is being effectively treated without at all enlarging his PDA (which is just classified as "trivial"). The blood flow around his heart and lungs is not being affected by either issue currently, as I understand it. Oh, I hope and pray God heals him! The doctors are going to start weaning his nitric oxide (the treatment for pulmonary hypertension) very gradually and see how he does using repeat echocardiogram investigations. His lungs are still very sick, of course, necessitating the heavy dependence on the oscillator, but we're grateful they've been able to wean the settings some. He still requires a lot of pressure to keep his lung tissue open, likely due to the surfactant gene mutation as well as the scarring that's already occurred due to oxygen and machine use. So the focus is to treat the lungs and wait and hope he can grow faster than this mutation and injury can hold him back. 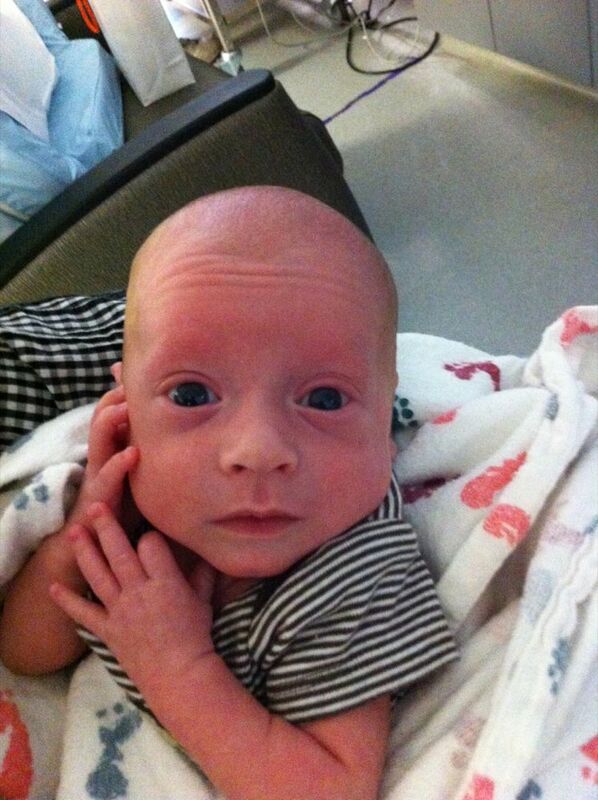 He's now 5 lbs 1.5 oz! The other kids are doing well. 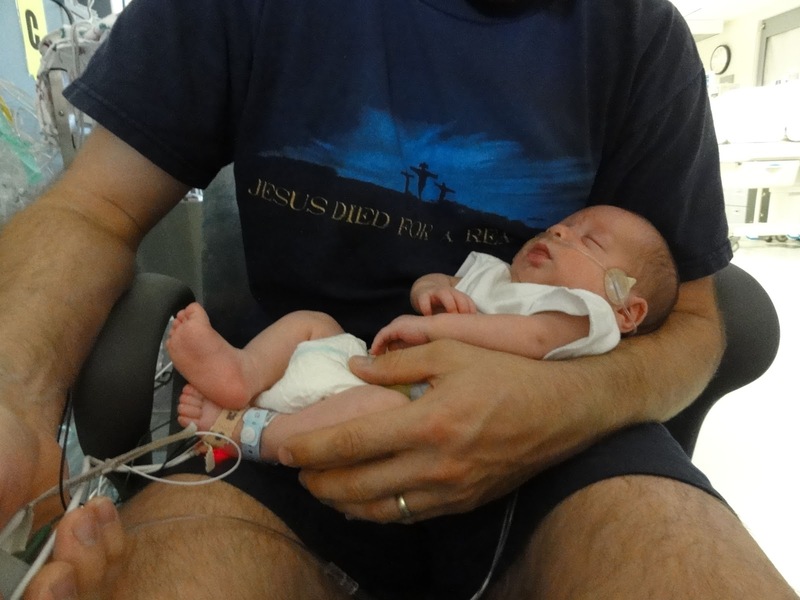 Will had to be put back on cannula because he wasn't able to keep his oxygen saturations in the 90%s without a small amount of oxygen, and now that he's such a big boy he needs more oxygen for his growing body! He's 6 pounds 4 ounces. 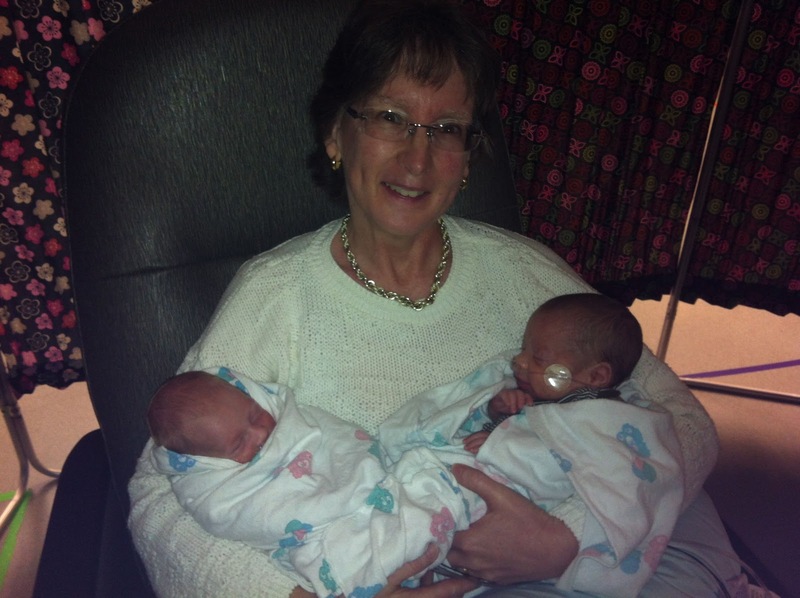 Gracie is 3 lb 12 oz, David is 4 lb 10 oz, Marcie is 4 lb 9 oz. Gracie and Marcie are still having periods during which they forget to breath and drop their heart rate. We pray they outgrow that soon. 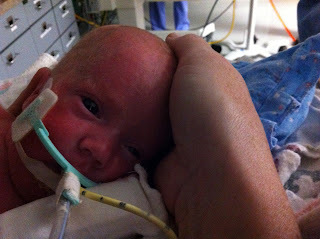 Both are still on high-flow cannula and a bit of oxygen, Gracie more than Marcie. David is the only baby not on any breathing assistance at all. He's also the best eater, although the past few days he's not been the best nurser, despite starting out so eager. Will wins the nursing prize, hands-down! David loves his bottle too much, but honestly it might be nice to have babies that prefer the bottle. It would be hard if all were clamoring for my attention. :} Will hears my voice and starts rooting around. So cute! The other babies are such a blessing to hold and cuddle at a time when I can't hold and cuddle Seth much at all. That doesn't take away our sadness about Seth, of course, since we only have one Seth and love him as dearly as we do his siblings, but at least there is lots of outlet for my maternal cuddle instinct and Gavin's desire to hold his kiddos. He's a great dad! He's pretty nuts about the babies. :) He's also incredibly involved with Isaac, playing with, reading to, and parenting him, all of this in addition to working parttime at the Center near us. 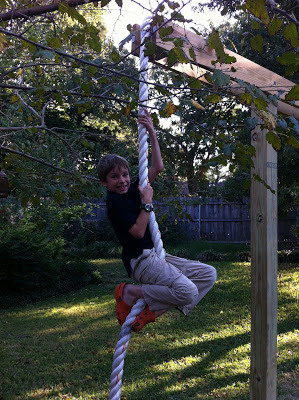 He loves having the chance to labor with his hands and get projects done for various departments there. I am very proud of him and grateful for him! I'd better end this very long post. Thanks for caring, reading and praying. We'll keep you posted as able! Not much news, but our babies are cute!